You've just arrived in hell, can you find your way out? 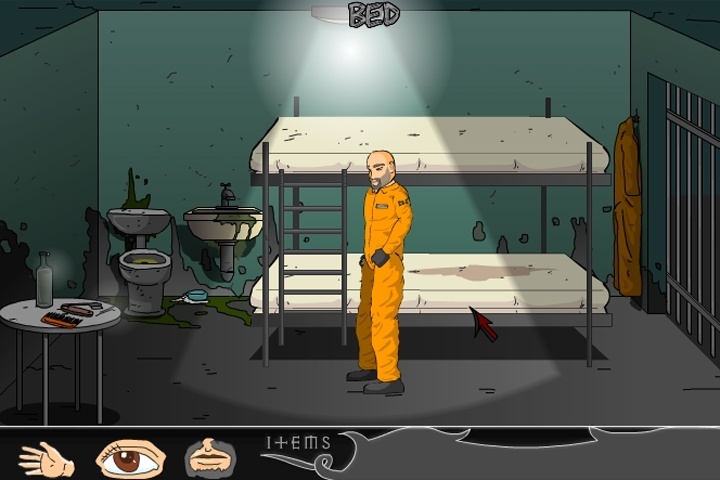 You are in a prison cell with notorious criminals until one night some mysterious thing happen..
Use your mouse to point and click. This moves the character around the screen. You can click on objects to interact with them. There are 4 interaction modes. Hand to pick up/ slap / grab objects. Eye to look / inspect objects. Mouth to talk / lick / eat objects. If you want to play Arrival In Hell games online you have come to the right place! GamesLoon adds new Arrival In Hell games every week. This is your game portal where you can find the biggest collection of free Arrival In Hell games online. Do not forget to rate our Arrival In Hell free online games while playing!